The consistently strange, dependably wonderful Jad Fair has gifted fans with a concise, enjoyable and, as always, bizarre, new Half Japanese record. Perhaps it could be said that people, in general, could be divided like this: those who like Half Japanese and those who have never heard of them. True, band leader Jad Fair’s vocal style is less than conventional, and sometimes the melodies on which the band’s music are hung are not so easily decipherable. However, if you’re someone who is entrenched enough in the world of music, obscure or not, there is something immediately lovable about the band. Even if you can’t spit the lyrics to “US Teens are Spoiled Bums” from the band’s 1987 album Music to Strip By by memory, you very well may find the premise of the song amusing and therefore likable. 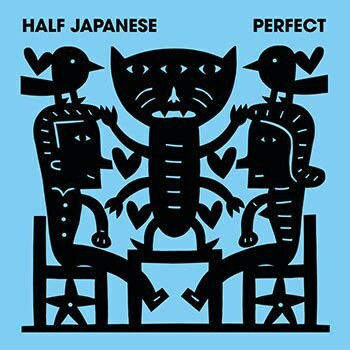 Half Japanese has been making oddly accessible pop music for decades. Whether you’re looking at the low-fi recordings that make up the band’s early discography, (music that felt so delightfully topsy-turvy that it could be played at 33 1/3 rpm and 45 rpm for an equally disorienting yet pleasurable listening experience,) or the more traditionally recorded albums that have been released in recent years (2014’s Overjoyed being a prime example) the odd, charming world created by band leader Jad Fair is nothing if not consistent. Perfect, the band’s new effort, is very much an attractive sibling to the equally pleasing Overjoyed. The songs, although often short and sometimes bleeding easily into the tracks before and after them, are defined and crafted in a meticulous fashion like some sort of art pop from another dimension. The album feels cohesive. Opener “That Is That” is rife with the positive truisms that Fair often sprinkles his work with, which makes the grungy, crunchy opening guitar riffs all the more effective. Right away Fair is sending the listener headlong into what has always been his expertise: weird punk rock. And they’re not going to leave without some life-affirming sentiments to take along with them. “We Can Not Miss” takes the high energy of the opener and doles it out into a consistent rhythm that fluctuates throughout the duration of the album. Between “holy smokes", and “holy cows", Fair keeps his vocals in line with what fans love and know so well: his ability to take childish phrases and somehow lance them over genuinely compelling, sometimes perfectly snotty, guitar rock. It might sound like he’s relying on various strange non-curses throughout the song, which may or may not actually be about someone’s understanding that they genuinely can’t mess up a situation, but the way that the words lay over the music makes Fair’s sentiments seem positively genuine. The best thing about Perfect is that picks up momentum during playtime, with the album’s namesake, “Perfect", which falls in the earlier half of the record, sort of defining that pick-up. Although one expects guitar rock from Fair, (which they get, in the highest order, on this track,) the listener is also treated to unexpected and artfully placed whistles and undulating percussion. Much like Fair’s manipulation of truisms, phrases remembered from childhood and the utilization of his unconventional vocal style, Fair takes sounds that border on a novelty quality and lays them together in a genuinely interesting way. The album serves up soundscapes that you wouldn’t necessarily associate with Fair on the regular, with the reminiscent-of-Robyn-Hitchcock “Man Without a Shadow", which relies on some atmospheric production that leaves Fair’s vocals in an intriguing mist of sound. Fair has a knack for taking sentiments that very well might come across as profoundly cheesy if made by anyone else. Few artists have this ability, with Jonathan Richman and Fair being the two most readily citable artists with that stunning capability. If nothing else, Fair wants to impart some life lessons to his fans, such as truly enjoying life, following your heart and finding some kind of value in romantic love. Sure, Perfect may not draw in more Half Japanese fans. But it will certainly please those who have already been converted.